Had another disturbed night with a tickly cough that wakes me in the small hours and then prevents sleep for some time. I've had four good weeks of training and think I would benefit physically from a cut back - just need to convince my head! Forecast is for the weather to worsen as the week progresses so that may make it easier and Friday is already planned as a non run day as we're at the GFS so we'll see what I can manage not to do. LmH - I think you should always have a cut back week every 4/5 anyway. It's all relative something like 15%, which still means 60 mpw for a 75+ regular. Don - that's the sort of stupid thing I'd do. Hope the xray gives a firm result. Gobi - Well done on the win! Joined 3 clubmates on a trail route I'd not done for a long time. Much of it all churned up with some sticky ups and downs. Legs managed to hold on, although I did feel the last 2 or 3. Longest run in months. Timekeeping at junior xc fixture in the afternoon. Very likely looking at times the first 5 of us had done this before but myself and 2nd were a long way clear of everyone else. I know I wouldn't make a habit of doing these but I just needed to test myself offroad before I get back in with the big fish. Lyrics: familiar, so that's a no. What: 6.3k at a fairly gentle pace, not that it felt like it. Off road, but mainly very firm. (Tram track to Burnage pr then Galleon then banks, Fletcher Moss to finish, OH). Why: have been running with M73 on a Monday morning but he wasn't available so ran solo, and it was so much harder. Not helped by an irritating calf which may well stem from an annoying Achilles. Rest now until tomorrow evening. Did you go to Wembley, Wabo? A good win. Off for another blood test: had one last week but they somehow failed to check my vitamin D level despite it being clearly on the form. All other results like calcium and cholesterol ok.
Dustin gosh how does your knee feel after 15 + on the trails? 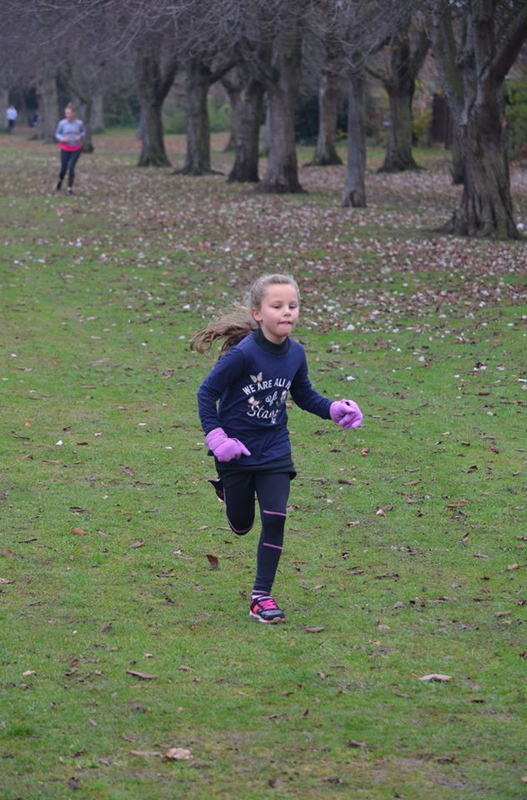 Thats Cleo on her 3rd junior park run. I ran with her, with a hangover and belly full of Curry!! Glad your other results were ok Alehouse - I take Vit D through the winter anyway. Good that your knee held up to that run Dustin, hope tonight isn't too painful. I was thinking of keeping it down to around 60 miles this week - the poor weather will help. Do you have any other races lined up Gobi? Morning again! Back from blood test in record time! LMH: good run? I take calcium with vitamin D year round due to my risk of osteoporosis. There is some concern about me not retaining the vitamin D, hence the importance of the test. It was Alehouse - more so than I expected and the rain stopped before I went and the sun came out whilst I was running so it just got better. I know Dustin, the whole way round she kept saying, oh my legs, oh I think I am faster than last time!! She can go faster. Its a confidence thing though as she hold my hand most of the way and as soon as she lets go, at the end, she is off! LMH - Pacemaker at Stubby 10km for a girl I coach but nothing else booked but I have a list of races where I need to select the ones I need to do. alehouse, I did a race on Saturday, it was ok, and awful. lol. So the run was ok but the weather was awful, Wabo? Chingford League? Dustin: Love trails, jealous, although I did get but muddy up back of the legs this afternoon. out of interest where do you run the trails down in the smoke? Ale: Good that all other levels (apart from D) are good. Running really keeps cholesterol down, my cholesterol level two years ago was very low to the point there was a stewards enquiry, roll back 15 years ago it would have been a bit of blood with cholesterol. Wabo: Good 2.5, these miles really accumulate and fantastic picture, you must be beaming. Yesterday did 'nowt, me and my girls went window shopping in toy shops and clothes shops. That actually sounds quite an ordeal yesterday Benjy!